Attention reality shows that have been airing for several seasons and are starting to feel a bit stale: hire Nigel Lythgoe immediately. And yes, The Amazing Race, I'm talking to you, too. Hot off the heels of a fantastic seventh season of So You Think You Can Dance that brought major changes including having only 11 finalists paired with All-Star alumni, Nigel has unveiled that change is a comin' to American Idol, which he recently returned to as executive producer. American Idol's tenth season begins in January, and there has been much speculation about how the show will survive following the departure of Simon Cowell and a lackluster ninth season (did Lee Dwyze seriously win that show?!). The show already announced a lower eligibility age and new judges Steven Tyler and Jennifer Lopez as well as the restructuring of "theme weeks" (they will now just focus on decades instead of artists) and the addition of mentor Jimmy Iovine. Last night, Nigel revealed to TVGuide.com even more changes to the upcoming season, which premieres on Fox on Wednesday, January 12. In an effort to produce successful artists instead of just reality show winners, the show will charge contestants with, among other things, producing music videos, organizing self-promotion and awards-show-style productions. The show has also decided to eliminate the semifinals portion of the competition. Says Lythgoe, "I didn't think [the top 24] were very good, I was bored with them by the time they got there." Amen! Plans for how to get from a large crop in Hollywood to a Top 12 are still in the works, but I am happy to bid farewell to the heinously boring semifinals round. And if all of that wasn't enough, Nigel also revealed to TVGuide.com some reworkings to next summer's season of So You Think You Can Dance. Instead of starting with 10 (or 11) finalists and immediately pairing them with All-Stars, the show will go back to the Top 20 format it used for the first six seasons. Then, once the dancers have been narrowed down to the Top 10, the All-Stars will return and be paired up like in Season 7. Basically the best of both worlds, and a great chance to become familiar with the dancers before they get teamed up with our favorite alums. No word yet on who the Season 8 All-Stars will be, though we can only hope for the return of Twitch, Mark, Neil and Allison and the addition of other greats like Katee and Janette. It's also unclear who will be on the judging panel next season. Although Mia Michaels replaced Mary Murphy for Season 7, the Queen of Scream was present at Tuesday's auditions in New York along with Nigel and Jason Gilkinson. Of course, she did the same thing in Season 7, so who knows. For now, Mary's keeping mum on the situation, saying only, "I'm not at liberty to say at this second, but check back in January." I am beyond thrilled about all of these changes. 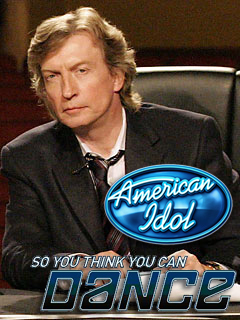 It's time to shake up the format on Idol and I am excited to see the combination of formats on SYTYCD. What do you think, dear readers? Are you still mourning the departure of Simon? Are you excited to see music videos on Idol that aren't just promotions for the Ford Focus? And which dancers do you want to be All-Stars next summer?